The best Creamy Potato Soup recipe with all your favorite toppings. Perfect for any week night meal! Chop onions, carrots, garlic, and parsley. Melt butter in large soup pot over medium heat; add onions, carrots, garlic, & parsley and saute until soft, approximately 5-8 minutes. Sprinkle flour over vegetables and cook, stirring, for 2 minutes. Slowly pour in vegetable broth, stirring well. Add heavy cream, milk, potatoes, salt, and peppers. Allow soup to simmer and thicken until potatoes are well-cooked, approximately 25-35 minutes. 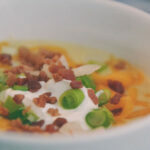 To serve, ladle into serving bowls, then sprinkle with cheddar cheese, chives, sour cream, & bacon.